Well, I am a bit angry and very sad to have to report this to everybody. 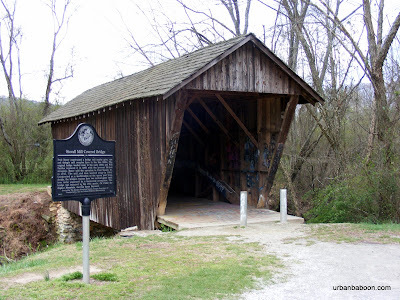 Most of you know that I am attempting to visit, among other places, every covered bridge in Georgia. And this one particular covered bridge had been getting bumped from my travels due to the onset of night over and over again. It was very close to Helen, Georgia and I always figured I could get it next time. But as luck would have it, I made it to the Stovall Mill Covered Bridge, camera in tow, this past weekend. Now, I was prepared for a lot of things. 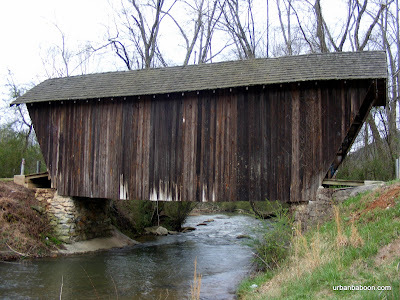 I knew that this was the smallest of the covered bridges, being one lane wide and a mere 33 feet in length. So I thought I might be a little underwhelmed by its tiny size. I knew that it wasn’t built by one of the famous bridge builders, but rather by Fred Dover, a local man, who owned the grist mill and some other nearby businesses. But, having also read that it was featured in the 1951 movie, I’d Climb the Highest Mountain, I figured that it would be worth a quick visit. 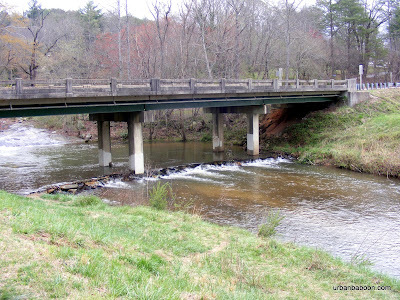 As I approached the site, just three miles North on 255 off 75 out of Helen, everything looked good: easy access, nice little stream with a old handmade dam next to it, and the beauty of rustic brown Georgia wood. But what I found inside made me a little sick to my stomach, the entirety of the inside was littered with graffiti. It was a desecration. 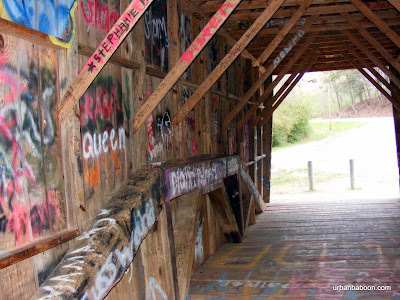 A beautiful piece of our Georgia countryside was destroyed by idiots most of them leaving their names on the wall. Gale, Dennis, Robert, Beverly, & Zach (just to name a few) should be ashamed of yourselves and if you are ever found you should be prosecuted and forced to do restitution. If you know one of these people, punch them hard in the arm for me. If you are one of these people, get a few of your buddies together and head to the White County Historical Society to apologize and offer to help repair what you damaged, hopefully not irrevocably. This whole thing makes this baboon very, very sad. Now if you can look past the graffiti, what you have is a wonderful piece of Americana. 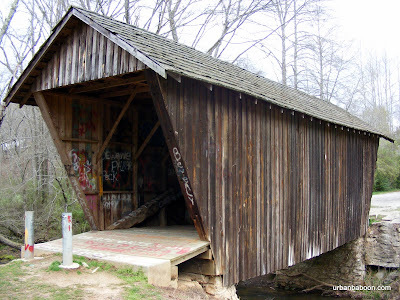 A cute little covered bridge built way back in 1895, easily 80 years before the hoodlum vandals were born. The woodwork on the inside is a maze of beam unlike any other bridge I have seen. It even has its own ghost story , the claim being that if you stand in the middle of the bridge at night you will hear babies crying or the approach of unseen horse drawn carriages, but alas we went in daylight hours, but I’ll check back later. The State of Georgia is blessed with many fine locations of natural beauty. And we as residents of the state are fortunate to have a State Park System committed to preserving, protecting, and facilitating our shared natural resource. 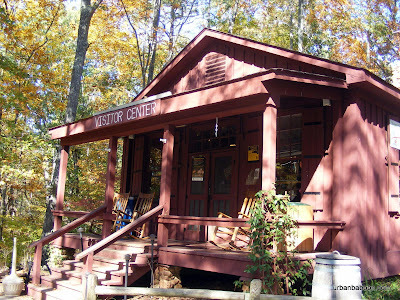 Just to give an example, I’d like to tell you about a fine-looking state park about 45 minutes Northwest of Atlanta called Red Top Mountain State Park & Lodge . 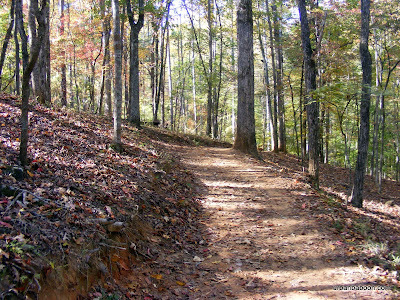 Red Top mountain is home to about 11 miles of hiking on 6 separate trails. Most are shorter and very easy to do. The two longer ones are the Iron Horse Trail (which allows Bicycling) and my personal favorite and the subject of this article: the 5.5 mile Homestead Trail. Now don’t let the Mountain in the name scare you, the top elevation is merely 1060 feet and the trail is more of a nice walk around the mountain rather than any real type of uphill climb. The park's website list this excursion as moderate in difficulty, and I concur, but I think its on the lighter side of moderate. There are some ups and downs but no significant patch that should really take the wind out of you. The trail itself has very good footing mostly of compact soil, namely Georgia Red Clay, from which the place gets its name. The 5.5 miles does mean at least a two hour commitment, so its not for the very casual stroller. The best thing about the trail is the views of the water. 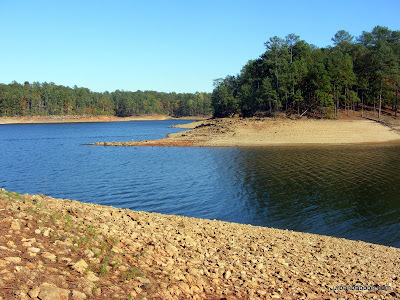 The park is on a peninsula created by the damming of the Etowah River, which created Lake Allatoona. The water views to the East are the River and to the West is the Lake. There are a large number of places where you can break from the trail and explore the water, even getting a little wet if you are so inclined. 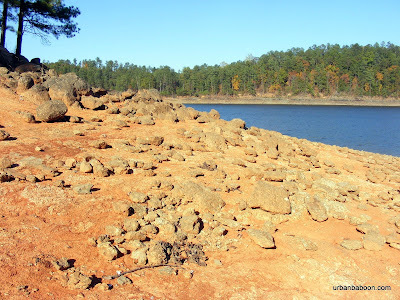 Along the waterside, there are also some interesting rocks on which to climb, which should make it fun for kids. The Lake itself is a very popular destination for water enthusiasts, so you might see a pretty sailboat or motorboat to enhance the view. 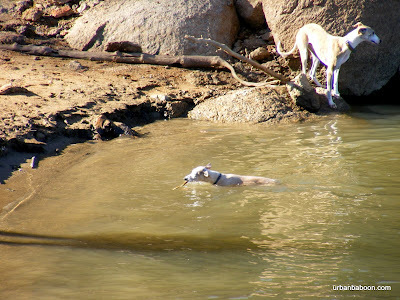 The trail must also be very dog friendly because we encountered more than half a dozen canines along the way. The reason I bring this up is two fold. First, this is a very nice park close to Atlanta with a good trail that fits all my required criteria: Scenic Beauty, Good Exercise, and a break from the clutter of city life. But also because I read that the State Park System is thinking of thinking about upping the parking rate for areas such as these from $3 to $5 ($30 to $50 for a season pass). And I wanted to go on the record that every time I drop my $3 in the parking slot this thought goes through my mind, "I get all this for me and my friends for $3 bucks??" I almost feel as if I’m stealing something. I know times are tough but its still a value, and if the good folks at Georgia Parks & Recreation continue to provide places like this to people like you and me, I support them 100%. If you care to exercise your rights at as a citizen, public hearing will be held on April 6 at the Floyd Towers East in Atlanta from 9am to noon (Directions). But back to Red Top Mountain, this is a good place to get away and unwind, to get your blood moving, and enjoy the nature of Georgia. And the fact that its relatively nearby makes it a real bargain at either price. 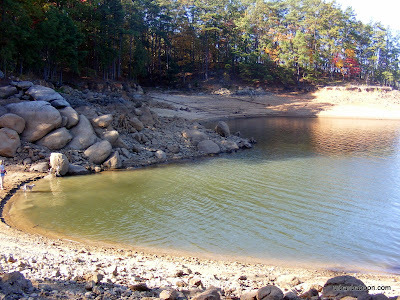 And it gives you a nice reading on the impact of our water consumption and drought status as Allatoona is used for water supply for the surrounding areas.